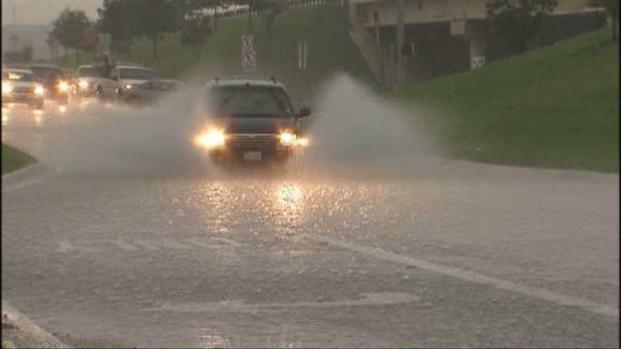 A strong storm pushed through North Texas beginning around 10 a.m. Monday and lasting into the middle of the afternoon. Hail ranging in size from dime to ping-pong ball was reported with the storm along with flooding in some low-lying areas. Oncor Electric Delivery said outages were down to about 741 across Texas, most in the Fort Worth Metro Area (415). Oncor said 98 customers were without power in the Dallas Metro Area. About 40 inbound flights to Dallas-Fort Worth International Airport were diverted Monday because of the weather. Airport spokesman David Magana said the planes diverted to cities such as Abilene and Shreveport, La., to wait out the storms and then would continue on to DFW. Weather conditions along the Trinity River are humid and windy as the water continues to rise slightly after Monday's storms. The chance for severe storms exists throughout the week with more potential for large hail, damaging winds and tornadoes though dry weather is expected to return Thursday and Friday. See NBCDFW's complete forecast here.